Mandy: I assumed full ownership of The Kritter Sitter, founded 10 years ago by Karen Kaufman, on October 1, 2017. I've been involved with the company from the beginning, and previously was a co-owner. I'm proud - and honored - that Karen has now passed the torch my way, and am excited, humbled and ready to roll! Together with our a great Administrator and wonderful pet sitters, I look forward to building on The Kritter Sitter's prior success, further developing the business even as we continue to provide the outstanding service that's our hallmark. Deb: I'm so excited to be a part of The Kritter Sitter! I have 20+ years of experience in administrative and customer service roles. I have a real passion for problem solving and providing exceptional customer care, and am having a great time exploring all the ways I can do those things in this new arena. I spend a lot of my off-hours chauffeuring my kids to their cross-country meets; I also enjoy 80's music and reading. LAURA: I am a recent Wesley College graduate with a degree in biological chemistry. And, I have a houseful of animals! Right now, I have 5 cats that I own + 1 foster cat, a dog, a bearded dragon and a goat! (Well, the goat doesn't live in the house, exactly...) I've lived with animals all my life, so my caretaking repertoire pretty much spans the species from fish and mice to goats and horses. And I just love them all, so pet sitting is a real joy for me! DONNA: I'm originally from Long Island, New York, but have lived in Delaware since I was 12 years old. I've always been an animal lover, and have had all sorts of pets - dogs, cats, frogs and snakes. I seem to be an "animal magnet" - maybe it's my bubbly personality? I also work as a physical therapist; caring is just in my nature. JUDYTHE: I'm originally from Newark, but have lived all over the country, courtesy of the United States Air Force. I've always had pets - including hamsters, mice, dogs, cats, a bearded dragon, anoles, goats and even a hedgehog! My grandfather owned a chicken farm when I was younger, and I would help him during the summer. I volunteered as a docent at the Salisbury Zoo while in college, and rode and cared for horses in New Mexico. I'm currently living in Magnolia with one dog, Manny (that's him in the picture), four cats, two goats and a bearded dragon. MATT: I'm a recent transplant to Delaware, having moved here about four years ago. I've always had animals, including dogs, cats, birds, lizards, snakes, fish, horses and a few ferrets. 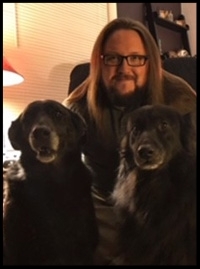 My current pet family includes Tori and Sula, two wonderful Lab / Newfie mixes (that's them in the photo! ), and three cats - Pi, June and Audrey. I've had veterinary technician training, and have worked as a veterinary assistant; I've also trained and worked in customer service. I take great pride in caring for others' beloved fur family members, and love spending time with them! JENNA: I am a Delaware native, born and raised. I'm currently in school to become a nurse; I love caring for both animals and people! I had a cat, Chloe, when I was growing up, and now I have my Shih Tzu, Harley - that's him in the photo with me. I can't wait till I can fill my house with pets one day! Steph: I was born and raised in Delaware, and have always loved animals. When I was little, we lived in the country and I would adopt every stray cat that wandered into our yard. I work as a manager at a local optometry practice, and have two wonderful children and a beautiful granddaughter. I know for most of you, your pets are part of your family. I take great pride in easing your worries when you are away; I’m dedicated to providing your pets with the best possible care in your absence. I really enjoy meeting each pet - and pet “pawrent” - and love working with the fur families I have the pleasure of helping. Sherry: I’m not a native Delawarean, but I’ve lived here nearly 30 years. I’ve had many pets throughout my life (mostly dogs) and have three dogs now - as you can see from my picture! They are (left to right) a Biewer Terrier, and dachshund, and a Brussels Griffon mix. Often, I also look after my grown children’s dogs. I’m retired now, and excited to be able to work part-time at a job that lets me interact with animals - something I truly love to do! Caitlin: I’m a native Delawarean, and live in Kent County. I’ve had pets all my life - rats, dogs, rabbits, a hamster, an anole (lizard), and salt water fish and corals. Now, I have the two rats and three dogs you see in my picture! I’m excited to be pet sitting - I love getting to know all kinds of different animals and breeds of dogs. That last could be especially important, as I’m thinking about starting a pet grooming apprenticeship next year. Susan: I’m not a native Delawarean, but I’ve lived here for many years. I’m retired from a job with the State, but am not quite ready to just rest on my laurels. 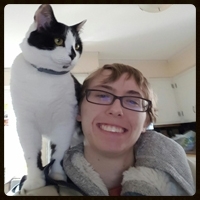 Employment as a pet sitter with the Kritter Sitter is a good fit for me! I’ve had bull terriers for more than 35 years - their general goofiness is just irresistible! Pictured with me are my current two girls, Phoebe and Stella. In the past, I’ve also had cats, birds, mice and fish - and can fully appreciate how important it is to have good, reliable care for your furry family members! I’m excited about this stage of my career, and looking forward to caring for your fur family.